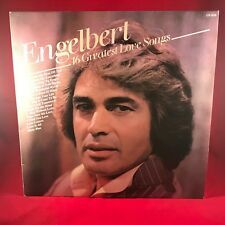 ENGELBERT HUMPERDINCK 16 Greatest Love Songs - 1973 UK Pickwick Label vinyl LP - CN 2070. A Man Without Love. What Now My Love. I Wish You Love. Love Letters. Cover : Excellent. Love Is All. Record Condition : Excellent. NO PICTURE SLEEVE, GENERIC SLEEVE ONLY: Rare UK Promo - Blue / White Labels ! Format: Vinyl, 7", Single, 45 RPM. Records advertised as Sealed or Unplayed should be Mint. The cover and contents suffer from folding, scuffing of edges, spine splits, discoloration, etc. POOR: The record will not play properly due to scratches, bad surface noise, etc. Format: Vinyl, LP, Compilation. Records advertised as Sealed or Unplayed should be Mint. Writing on back sticker mark on front edge & ring wear. ENGELBERT HUMPERDINCK LP LIVE AT THE RIVIERA. Cover Condition : Very Good Vinyl Condition : Excellent - Genre : Pop UK Pressing Note: Any records purchased from Life of Vinyl will come with a new polythene cover sleeve and will have been cleaned using a professional vinyl record cleaner. Record is in excellent condition. There are some minor surface scratches which causes a little surface noise in places but plays very well overall. The sleeve is in very good condition with some slight creasing and slight scuffing to the corners. Postage combined. Returns accepted as long as the buyer pays for return postage. All records sent in sturdy mailers. Any questions please feel free to contact me. THE RE CORD IS IN VERY GOOD CONDITION OVERALL. THERE IS LIGHT BACKGROUND CRACKLE THROUGHOUT. THIS IS NOT TOO OVERPOWERING OVERALL THE SOUND QUALITY IS VERY GOOD. NO EXCEPTIONS.